I first had cioppino in 1977. Bruce Wright and I drove a pickup load of stuff out to San Diego for my sister Anne who was moving there. My Uncle Dean (one of my Mom’s brothers) lived there and he took us to the Brigantine  on Shelter Island Drive for cioppino. Cioppino, at least in its roots , is a rustic seafood stew. For a 20 year old Indiana country mouse, it was about the most exotic thing I’d ever eaten. 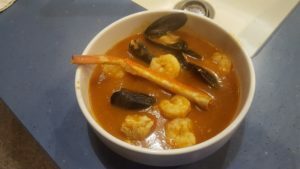 I make cioppino every now and then, and with the weather turning cold it sounded good so I made it again today. It’s just a tomato and seafood broth with shrimp, fish, mussels, and crab. It’s light and tasty and exotic, and for me, nostalgic. This is how I made it tonight. I’m the furthest thing in the world from an itinerant fisherman, so there’s probably nothing authentic about it. But it was the best cioppino I’ve ever made, and almost rivaled my memory of the Brigantine’s from 1977. Roughly chop the onion, fennel bulb, and garlic. Saute them in 2-3 tablespoons of olive oil on low heat until they’re softened. Add the tomato paste, tomatoes, wine, stock, salt, pepper, and bay leaf. Toss in the fennel fronds. Simmer for a half hour or so. Fish out the bay leaf and fennel fronds, then puree it in a blender. Return to the pan and cook until it’s thickened a bit. Taste and add salt, pepper, and red pepper to your taste. At this point you can refrigerate or let it simmer until it’s almost time to eat. About 10 minutes before eating time throw in your seafood. Bring it to a boil and then crank back to a simmer until the seafood is done. Enjoy with crusty bread and remember 1977. 1. It’s still there. But there’s no cioppino on their online menu. I was in San Diego in 2006 or thereabouts and went there for supper out of nostalgia. 2. In its roots it’s what the fisherman ate, cooking what they couldn’t otherwise sell. Now it’s an expensive restaurant dish. 3. That’s what I had left over after selling my catch at the docks! Hahaha! No, that’s what looked good in our very limited seafood choices here in northeastern Indiana. I’ve had cioppino around the world now and none of it rivals that first bowl at the brigatine. -- James Taylor, "Country Road"